Cough is a sudden explosive force of air through the glottis (vocal folds). It is an essential mechanism for clearing secretions and harmful materials from the trachea and bronchi. Although an individual may cough voluntarily, coughing is predominantly the result of an involuntary reflex stimulated by cough receptors in the airway. Chronic cough (CC), defined as a persistent cough of greater than 3 weeks duration, is no longer protective and is usually the result of aberrant stimulation of the cough receptors. Affected individuals have a diminished quality of life secondary to ensuing hoarseness, chest pain and muscle ache. Life’s daily activities become subject to frequent, disabling interruptions. 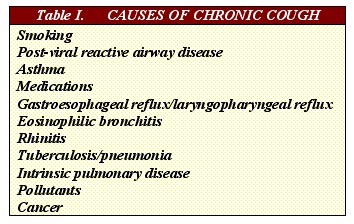 The most frequent causes of chronic cough are listed in Table I. The most common etiology is smoking. The more cigarettes an individual smokes, the more likely he/she is to suffer from CC. Up to 25% of persons who smoke 1 pack per day and almost 50% of those who smoke 2 packs per day will endure CC. Medications, asthma, post-viral reactive airway disease and reflux are other common inciting factors. In our experience, CC is frequently caused by multiple factors. We have developed a multisystem approach to the patient with CC. Individuals presenting to the Voice and Swallowing Center have usually been referred by their primary care physician after unsuccessful first-line therapy. We therefore utilize multisystem tertiary care diagnostics to arrive at a diagnosis expediently and relieve the cough. Our outpatient armamentarium includes but is not limited those diagnostics listed in Table II. At the UC Davis Center for Voice and Swallowing Disorders we have a chronic cough clinic devoted to the care of individuals who suffer from this debilitating ailment. The clinic also serves as a clinical research facility dedicated to improving the care of individuals with CC.